Hand Readings of famous people: Bernie Sanders or Hillary Clinton? Hillary Clinton is the practical, dependable sort, and the more aggressive, stronger personality. Bernie Sanders is more of an intuitive, ideating kind and certainly more of an intellectual. However, his headline shows pragmatism and common sense; he is level-headed and sensible, with stable, clear thinking, although he can be a little moody. control, better will power, and considerably more tact. Sanders' first phalanges dominate, while Clinton's second and third phalanges dominate. Bernie Sanders has a strong Fateline going right into the Jupiter mount. This sign invariably means a very high and powerful position at the end of one's life. But whether it means Senator (which Sanders already is) or President, one cannot tell for certain without examining his hand minutely and without talking to him personally about his aspirations. Check out a hand photograph of Bernie Sanders here. Both Sanders and Clinton are fairly straightforward, but have a distinctive manipulative side, although Sanders is the more secretive and conservative, and can hold his cards close to his chest. He is less open, less independent thinking. His hand shows that when it comes to ideating he is way up there, and his heart and feelings have an important role to play in his ideas. There could well be a question mark on whether they are doable ideas. He is not the strong headed aggressive type to push to get things done according to his beliefs. He is more likely to listen patiently to other views. A refined person, he is more of a thinker than a doer who needs a passionate team to help him carry through his ideas. Hillary is strong and independent minded, can be quite direct, is less tactful and possibly less reasonable than Sanders, but she has the broader outlook. When she thinks strategy, she will take into account the larger picture, and will do things that she believes will work and which will benefit all peoples in the long run. In actuality neither of them have strong negative qualities. Hillary Clinton and Bernie Sanders are just two very different people - two talented leaders. If one were looking for a CEO of a company then Hillary Clinton would be the obvious choice. What kind of President does America need today? Is it a practical, down to earth, CEO type preferable to a someone with a softer approach, someone with some really fine ideas? Hillary Clinton could rub people the wrong way and may not always carry everyone with her. She knows what she wants, and when she has the power, she will do it. But Bernie Sanders is the better statesman. A point to mull over is that Barack Obama is more like Bernie Sanders than he is like Hillary, although Obama lacks the warmth of Sanders. If Americans need a fearless doer, then that is what Clinton is. At least until someone better comes along, because Trump may not be it. *(They are running against each other in the U.S primaries). Related Reading: The hand reading of Hillary Clinton or a comparison of Hillary Clinton and Obama. I have a question, though. You say HC is the right choice if the US wants a fearless doer. And, that she keeps the larger picture in mind. But, (playing devil's advocate, sort of) what if she her beliefs about what's good is actually bad? E.g. Hitler used to believe that what he was doing was for the good of the world and will be remembered as a great man after he's gone. And, there's a long list of such people who have done disastrous things with the right intentions and great 'fearless doer' skills. Some people point out to her past record (voting in favor of terrible wars she later apologized for; being in favor of crony capitalists; in favor of GMOs; weapon manufacturers, etc.) and say that she's not good for world peace. Yes of course Ria. 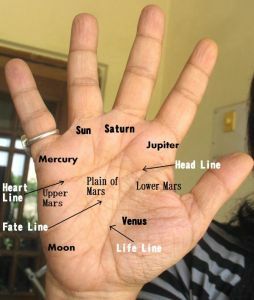 The hand reflects one's own mind so everything is to be read in context of that.